You might not want to spin round in a circle in public wearing a leotard before saving the day, but embracing your inner Wonder Woman is about experiencing life to the full. For the modern woman this means a good quality life that comes from being fit and healthy. Women don’t just want to get fit to look good, although that’s the icing on the cake and great motivation! It’s about being able to seize the power of your own life! Do you think that Wonder Woman didn’t look after herself? Of course she did! How could she ever possibly have helped out all those people? It’s good to remember that spending time on your own fitness means you are going to be better able to look after other people’s needs when they need you – whether that’s kicking a ball around with kids or helping out parents. 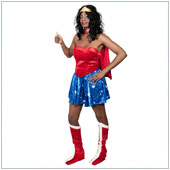 When Wonder Woman was in her prime she didn’t nip down to the surgery for a quick nip and tuck. Her great looking hair, skin and toned body came from being so active and no doubt eating a good diet on her days off from tackling supervillains. Beauty is more than skin deep but feeling good and seeing a healthy lifestyle reflected in your outward appearance is important too. There are many women who always seem to be starting a diet tomorrow. losing weight this year or getting fit for next year. Are you one of them? Being a Wonder Woman is about action speaking louder than words. Stop berating yourself for what you haven’t done and stop kidding yourself about what you might do. Try a new approach – do it now! As with most things in life there’s not always an ideal time to make big changes but no-one’s asking you to stop in the middle of the street and spin into a spandex comic book outfit. You don’t have to be superhuman! What all superheroes are blessed with, not to mention superheroines too, are superhuman powers. Of course running, jumping and lifting heavy weights is going to be easier for them but that’s not an excuse for you not to at least do something. You don’t have to run a marathon if you don’t want to. You don’t have to be the fastest, greatest or best at everything or even anything. Work within your own capabilities and prepare to surprise yourself with your own achievements. Even if you are nowhere near where you would like to be health and fitness-wise, find inner reserves of confidence to propel you there. Let Wonder Woman be a healthy role model, not a symbol of a fantasy figure you cannot hope to live up to. You will always meet people who excel more than you do. Accept this and let it motivate you rather than intimidate you. Want to join other would-be Wonder Womans? Getting fit in a supportive community of women can be a great way to fly high.